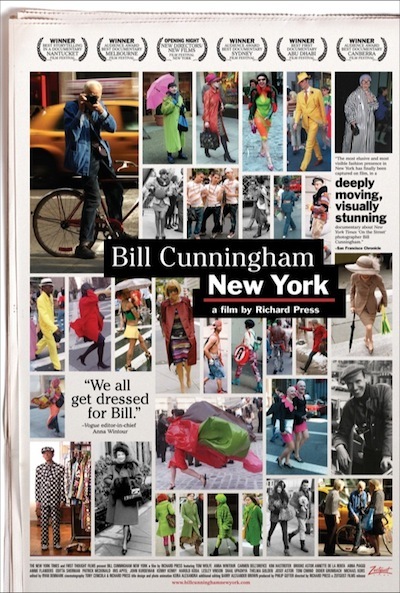 @BCNYthemovie tweeted that Bill Cunningham New York is in Seattle this week. 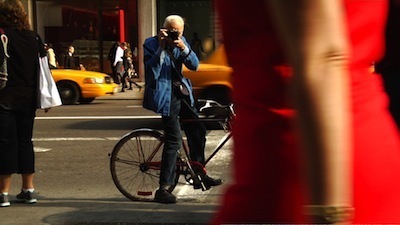 BCNY is a documentary about a fashion photographer for The New York Times, known for his candid street photography, and riding his bike. “We all get dressed for Bill,” says Vogue editrix Anna Wintour. The “Bill” in question is 80+ New York Times photographer Bill Cunningham. For decades, this Schwinn-riding cultural anthropologist has been obsessively and inventively chronicling fashion trends and high society charity soirees for the Times Style section in his columns “On the Street” and “Evening Hours.” Documenting uptown fixtures (Wintour, Tom Wolfe, Brooke Astor, David Rockefeller–who all appear in the film out of their love for Bill), downtown eccentrics and everyone in between, Cunningham’s enormous body of work is more reliable than any catwalk as an expression of time, place and individual flair. In turn, Bill Cunningham New York is a delicate, funny and often poignant portrait of a dedicated artist whose only wealth is his own humanity and unassuming grace. Previous posts about Bill include Style on the Street and Hunting Birds of Paradise. There are 5 showings of the film this Friday at the Harvard Exit Theatre and tickets are $10.00.